Let’s get you out of your head and out of your own way. 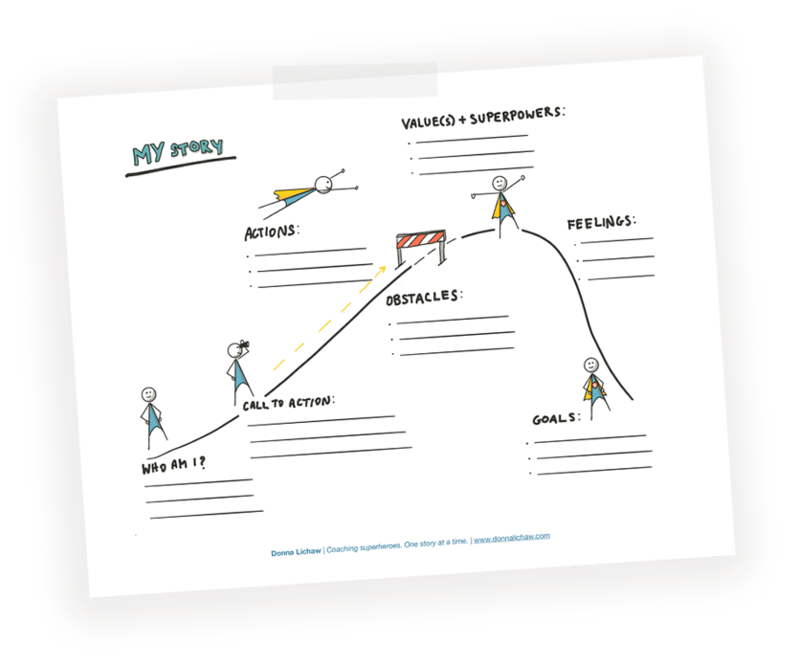 Using a unique blend of storytelling science, design and visual thinking, and gestalt psychology, I help people rewrite their stories and get on track toward meeting their career and business goals. We unearth narratives that hold you back and shift focus to those that propel you. Work with me to get clear on where you’re going, why, and how and get there in a style that feels powerful and authentic to you. All of that is a story—your story, your purpose, your journey. It’s one that you don’t just tell, but live with deliberate care and intent. You’ve got this. And I can help. I work with creatives, designers, technologists, and entrepreneurs—especially women, LGBTQ, and underrepresented leaders in tech—who want to make a difference at work, in life, and in the world at large. While most of my clients are director-level and above or run their own business, I don't care if you manage a team or not. I work with leaders—people who pave a paths, makes ripples, and move people (and yourself) forward and to action. You can manage a team or be a team of one. My approach is simple. Together, we establish goals and metrics for success, then develop a plan to get you where you want to go. Then we make things happen. No assessments, no values exercises, no rigmarole—just experiential, experimental, and organic progress toward your goals. We meet twice monthly for 3 or 6 months to start via Zoom, phone, or in my office in Brooklyn, NY. In between sessions, I’m yours when you need me via email, text, or phone. I wish it was more complicated. But it really is that simple. I keep my prices reasonable so whether you work at a startup or tech behemoth, nonprofit or or Fortune 500 company, whether your company is paying or your are paying your own way, we can still work together. Get out of your head and see what you can't see on your own. I've either been there, or I can help you find the right people to talk to. You guide us, and I keep us on track. While we work together, I'm accessible whenever you need me. Did I mention that I keep you on track? You already have the stuff. I'll help you see your strengths and how to use them. Get on the waiting list to schedule a free info session. Tell me a bit about yourself. Your answers don’t have to be perfect. I just want you take a few moments to think about what brings you here and what you want to get out of working together. As soon as I’m available, I’ll let you know! What is your biggest challenge or question right now? What is your biggest opportunity? What’s the shift that, if it happened in the next 6 months, would make the biggest difference for you? Once that shift has happened, what results would you want to see? What are you most confident about right now? Have you ever worked with a coach before? If so, in what context? Thank you! I’ll be in touch as soon as a spot opens up.